Please tell us the year established and brief history of Prestige Technologies?Prestige Technologies has been providing managed hosting services we started in 2002. When we started we were looking to provide a service to web designers and web developers, providing them with wholesale rates for hosting and also a support system they can use for development and applications. Since then we provide hosting on windows, linux, mysql, mssql, email, exchange, shopping carts, cms systems, and our own web based email marketing system. We offer a solution that not only provides a home for your websites but also a way to bring those websites to market with our web based marketing systems. We provide a relationship with our customers that allow them to lean on us for support 24/7/365. Not only is your website available 24/7/365 but we are as well. What is it that makes Prestige Technologies a competitive company in the Web Hosting market? Expertise, customer service, on site developers and designers. We really specialize in email solutions and database solutions. Since we created our own email system this helps us with understanding the hosted environment of email as well. With our developers always needing new database solutions we have customized database solutions for each customers needs. What new features have Prestige Technologies added for its customers in the past year? In the last year we have introduced Email Marketing Platform, Shopping Cart Platform, Exchange Hosting, Sharepoint Hosting and a 24/7/365 support team. What would you say is Prestige Technologies #1 asset to its customer base? Availability of account managers. Each customer direct contact information for their account manager that knows every part of their account. 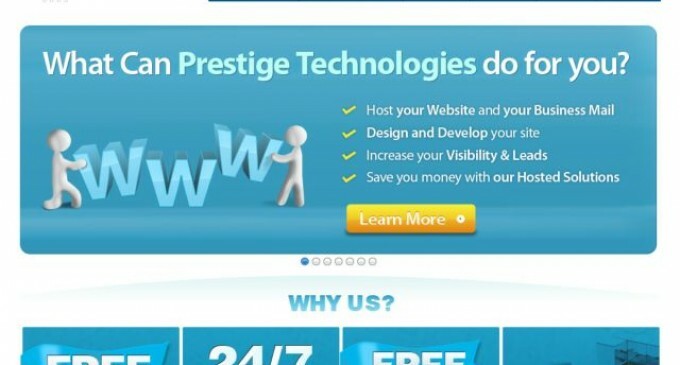 Where do you see Prestige Technologies and the web hosting industry in three years? Prestige Technologies will continue to provide excellent 24/7/365 customer service to our clients and focus on helping our customers move their applications into the Cloud. We will continue to integrate systems to make hosting and marketing a part of our clients hosted solution. Jersey City and Dallas, Texas. What kind of back up power do you have? We have redundant power connection from separate power grids, UPS, and onsite fuel generators with contracts to guarantee fuel delivery. Prestige Technologies offers 24/7/365 customer support via phone, online chat and email. We also have assigned account managers to every account. At Prestige Technologies we have technicians available 24/7/365. We respond to every ticket within 5 minutes to let you know we have received your ticket. We then follow up with a resolution within an hour or an ETA depending on how difficult the ticket is. All of our phone, online chat and email support is free. For our customers or partners who have advanced technical needs we do provide what we call “Managed Services” and we bill hourly or through a monthly maintenance package. We offer these services so really you never need to worry about your servers or software. We become your extended support team. Yes, we offer a 30 day money back guarantee on hosting and email solutions. If a customer is unhappy we try to resolve the issue but if it can not be resolved we issue a refund and all they have to do is send in a cancellation letter from their email account from signup. Thank you for your time and insight into Prestige Technologies.